+ Fix some icon + Add more icon. Is this skin also are problems with black page in Word and dark background in Google Chrome? Uhh, I'm having a little issue with the theme and I be soo happy if you could get back to me! I've installed the free version theme without any errors, but sadly all I can select in the personalization menu Dark CC Blue. The normal grey version is nowhere to be found? How do I get the standard grey version of theme? Is it in the paid version only? Buy theme to have full version and for suopport. Thanks! So does this mean the grey version is only included in the full version? And free is only blue? How can I know if I have Windows 10 RTM or November Update? Black background on many applications? The only problem is the cursor in the scrollbars (too bright). When the window is expanded is barely visible. Is there a way to not have the Office programs affected by the theme? Cannot work with most Excel docs without changing the font color to white, which would need to be changed back each time in order to share with clients, co-workers, etc. who are unlikely to be running a dark themed version of the Office apps. My dark theme was working fine until yesterday, when i started my pc it was white and i cant fix it. I could fix some but the file explorer is still white. I am having the same issue as the other unknown fellow. Anyone know a fix for the file explorer remaining white? Appearantly i cant because uxtheme and uxinit dll s are open in winlogon.exe and when i try to end that process it says access denied. Nevermind it works now, i could replace them somehow, my only question is if there is an after dark cc theme with orange accents, not blue. If i pay for this theme can you make one with orange accents instead of the blue ones? I installed the orange one you sent but it didnt allow me to replace all the files because they are open somewhere, and the accent colors are still blue, they didnt change to orange. Ok, so i downloaded a random theme and enabled that and then reeanabled the orange one so now it works, thanks. Thank you so much for buy my theme and please keep up buy theme for support. I'm trying it in the rs1 build and it is working pretty much perfectly, with the exception of the control panel left and top panes, that should be black according to the example screenshot. 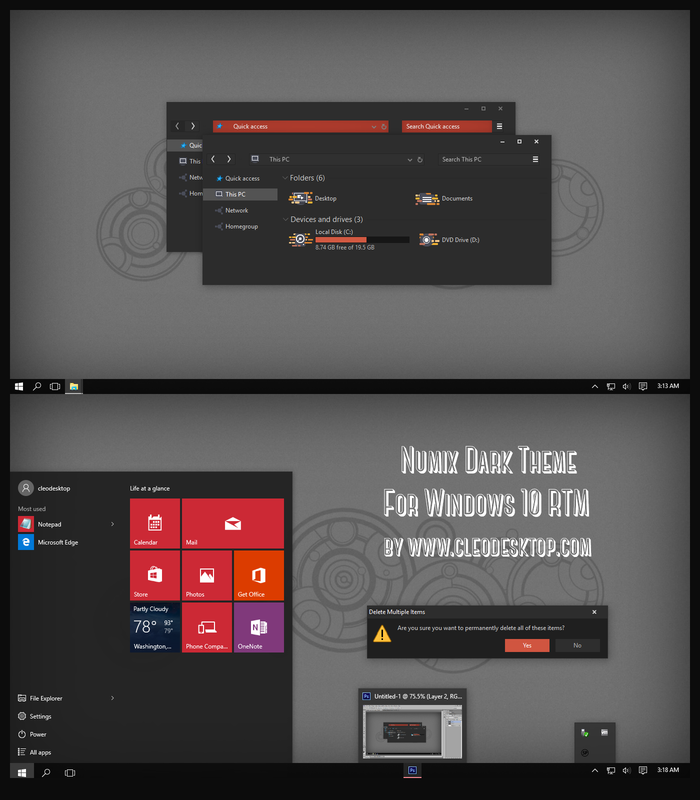 Just a quick question, does this theme have aero or that is not even in win 10? How to fix it please ? - Copy all file in "Theme For...\Hide Commandbar or Show Commandbar " folder to "C:\Windows\Resources\Themes". 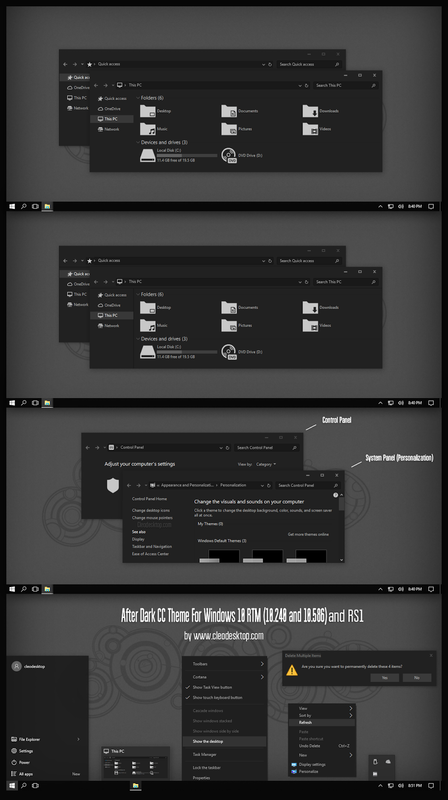 - Mouse right on desktop select "Personalize / Theme / Theme settings " and apply theme. I'm on the 10586 actually, 64 bits edition. Did I need to replace only the files in system32 or also in SysWOW64 ? Did you think it's better if I update my system to the Anniversary Ed ? Can you please make me an orange (RGB: 247 99 12, or HEX: F7630C) accent colored version also from the anniversary updated theme, and i would be happy if you could include the "up a folder button" because i use it a lot. i want to get the paid version , but i am new to windows 10 versions (newly migrated from macbook pro) so dont understand if this is the right one for me. can you help with this? System information shows build Version as 10.0.14393 Build 14393. SO is this suitable for me. Yes. It work on your windows 10 version. Just use theme in folder "Theme For Win10 Anniversary Update 1607"